Unfazed by the chaos of the rookery, the female sea lion stretched, her blonde pelt glowing against the dark granite rocks. Her midsection contracted, and she arched back, rolling over on her side. This continued until finally, a small head appeared between her hind flippers, shiny and wet, then the rest of its small body. Alert gulls pounced on the afterbirth that followed, squawking and squabbling until they settled into their meal. The new mother curled around, sniffed at her newborn and vocalized, a soft, throaty growl. It responded with a lamblike “ba-a-a.” Thus began a bonding that will last until her pup grows fat and fully independent. In the cold North Pacific from Japan and Russia, along the Aleutian chain fringing the Gulf of Alaska, and down North America’s coast to California, the Steller, or Northern sea lion, Eumetopias jubatus, embodies nobility, fearsomeness and yet frailty. Named for naturalist Georg Wilhelm Steller who first described them in 1741, these are the world’s largest sea lions. Their physique and demeanor demand that species sharing their territory give them a wide berth. Stellers prefer isolated mainland beaches and inaccessible islands, safe from disturbance. Throughout the region they were extirpated by hunters in the 19th Century. They partially recovered due to the Marine Mammal Protection Act of 1972 which makes it illegal to hunt, harm or harass them; some populations are further covered by the Endangered Species Act. But mystery surrounds the sharp decline of their Western Pacific population. Between 1980 and 2000 over 80% of them disappeared from Russian and Alaskan waters. The western population was declared “endangered” in 1997. The Gulf of Alaska population has stabilized, but continues to decline in the western and central Aleutians. Nutritional stress from food scarcity due to natural and human-caused changes in the abundance, quality and distribution of prey; killer whale predation, disease and parasites are suspected. More frequent, intense storms, pollution, and entanglement in marine debris and fishing gear also take a toll. NATURAL HISTORY: Steller males can reach 11 feet and up to 2,500 pounds. Females grow to nine feet in length, weighing a respectable half-ton. Their coats are tan to reddish-gold when dry, darker underneath. Short, stiff hairs permit efficient swimming and give protection on sharp rocky haulouts. Adult males develop a thick shaggy mane, which gives them an “Arnold Schwarznegger”-like build and a formidable bearing. Steller sea lions have broad leathery flippers, and can “walk” well on land. They have a wide, flat forehead, and males lack the sagittal crests sported by California sea lion bulls. Small external ears, and long, tactile whiskers (vibrissae) complete the ensemble. Their voices are low, gutteral growls or bellowing roars. BREEDING: Most of the Stellers’ breeding rookeries are in the Gulf of Alaska and Aleutian Islands. A bull fiercely defends his harem and territory for up to two months, fasting all the while. Pups are born in spring and summer, and average around 40 pounds. Maternal investment in her pup is intensive: she will nurse it without feeding herself for up to two weeks, then continue to nurture it as she teaches it to swim and forage for up to three years. Their diets vary seasonally and by location: mackerel, herring, capelin, flatfish, octopus and squid, rockfish; and walleye pollock, of fish-and-chips fame. 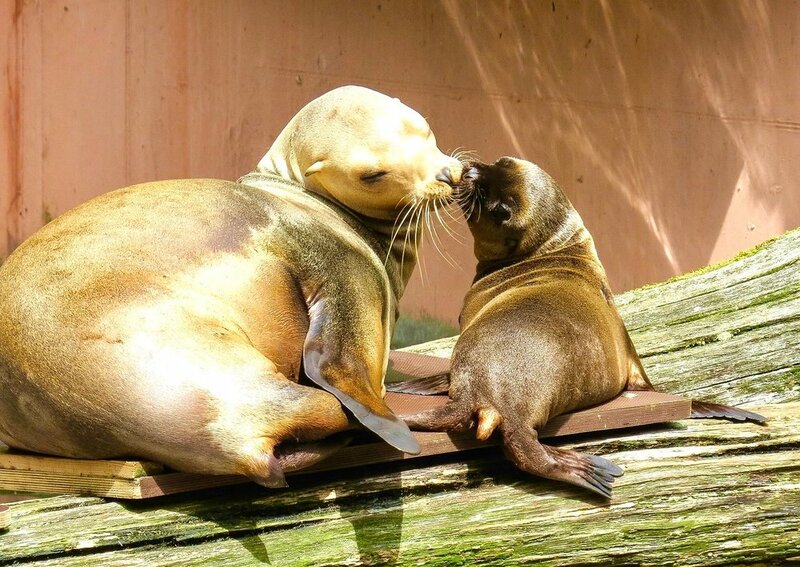 Sadly, juvenile Stellers’ reliance on this overfished delicacy in the Gulf of Alaska may play an unfortunate role in these young sea lions’ decline. Infamously, Stellers prey on endangered Chinook salmon and steelhead, which has significantly hampered these fishes’ recovery. This has generated a heated controversy, and scientists, fisheries and the conservation community are engaged in lively discussions about how to resolve the quandary. Regionally, the Steller sea lion rookeries at the Farallon National Wildlife Refuge in the northern Farallones Archipelago, and at Ano Nuevo Island within our national marine sanctuaries, designated as critical habitats, are thriving. Next visit to the coast, search them out: on jagged islets off Pt. Arena, the flat rocks off Fort Ross, near the Point Reyes Lighthouse, and Sea Lion Overlook. Nature cruises to the Farallon Islands often spot them. Admire, and wonder at the complexity of the world in which we and they live. See more about the salmon/Steller situation at National Geographic Video. And learn more about our sanctuary at https://farallones.noaa.gov. Mar 1 Scuttlebutt: The Green new Deal and . . .